That was my thought when I embarked on my annual long distance road test across France and into Spain; on this occasion at the wheel of the just released Lexus IS300h petrol hybrid saloon, the intention being to see how close I could get to a range of 1,000 miles between refuelling stops. The challenge gets strong as successive cars are fitted with smaller fuel tanks in order to save weight and, logically to improve fuel consumption. There is also no sense in crawling along roads causing a mobile traffic jam in order to create some sensational fuel consumption figure, my test always involves driving at legal motorway speeds and with average loads on board, but more about the economy aspect later. My first impression as I headed to the P&O ferry terminal at Calais was the superb ride quality of this latest Lexus and the quietness of the car at cruising speeds. It augured well for an enjoyable test session but I had yet to appreciate how important these qualities were to become as the test drive progressed. This svelte looking car (appearing even better in the flesh than in the many TV commercials I saw during my foreign visit) looks like a performance car and with a 2.2-litre engine developing 178 bhp and an electric motor contributing up to another 141bhp, it is quick off the mark with a claimed 0 to 62mph (100kph) acceleration time of a mere 8.2 seconds and a claimed top speed of 125mph that allowed for enjoyable and entertaining driving on both motorways and some interesting mileage on the edge of the Pyrenees. What I find a lot of people don’t appreciate is that, to a great degree, a hybrid car does not require any special driving techniques, though an eye on the onboard computer and a touch of lighter throttle use can see consumption figure easily over 59mpg and more when travelling are maximum legal motorway speeds. Lifting off the throttle but still maintaining the same speed on downhill motorway sections will see the energy reclaim system putting power back into the electric motor’s battery, just like the current Grand Prix cars. Of course, if there is a need to shake away from a motorway pack of traffic travelling at an awkward speed, then there is plenty of power on tap. Likewise, a trip down to the shops, driving at around 25mph can be achieved without engaging the petrol engine, which I found really did produce some amazing fuel consumption figures. A cautious good point is that this car is as silent as a ghost which is ideal at normal driving speed but requires extra vigilance if there are pedestrians not paying attention. Could this car achieve 1,000 miles on a tank? Yes, it could if the 69+ figure on the computer system could be maintained allowing 1,001.19 miles before running dry – an action what should not be attempted as no modern car engine benefits from lack of fuel. From what is now a small capacity fuel tank (66 litres/14.51 gallons) I managed 808 miles with the computer indicating a further range of 60 miles if driven in the same manner. Not bad for a premium class five-seat saloon carrying an average luggage load. 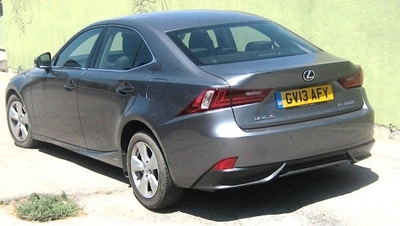 Since my earlier test of a Lexus IS300 the development has gone on, the official combined fuel consumption up from 60.1 mpg to 65.7 mpg, suggesting that 60+ mpg is potentially viable. The CO2 emissions figure has fallen from 109g/km to 99g/km, the tax disc showing zero payment! About a week into my test came the real test of this car’s ride quality. My wife slipped on the pavement and badly broke her elbow and arm. 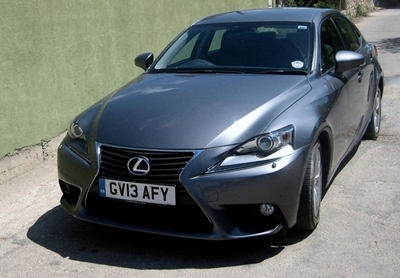 Taking her to a Spanish A+E and subsequently on a 1,000-mile return journey proved that this Lexus is one of the best riding cars one can buy. Interestingly, on arrival at the hospital about a dozen uniformed staff came out to greet our arrival, the English speaking receptionist telling me only two were there to deal with the casualty, the others came out to admire the car – one even offered to buy it from me! The ride quality and impressive handling is mainly the result a well engineered fully independent suspension system though I suggest that the Bridgestone road type tyres played their part. The electric power steering has excellent feel yet is light in action and the all disc braking system is smoothly efficient. In addition that CVT transmission complement the power unit, providing just the right ratios all the time in a totally seamless manner. The product quality is brilliant; the equipment specification, including an excellent satellite navigation system and rear view camera leaves little if anything to be desired; the finish is modern premium standard with plenty of leather and the extensive safety systems include LED daytime running lights and full air bag protection. A little bit more stowage space in the front area is all I could recommend. I suggest that for the foreseeable future, the hybrid direction is the way the motoring world will go – already in a short space of time Lexus has shown that it is cracking on with development. The discerning driver; the environmentally friendly type; the one who likes to cut a bit of a dash and, above all, the sage spender should check out the Lexus IS300h. MAIN RIVALS: Peugeot 508 Diesel Hybrid, Citroen DS5 D Hybrid. The company claims that the four-door fastback aims to shake up the segment with progressive body styling and daring proportions that challenge convention. Showcasing ingenious innovations, the Q80 previews autonomous driving technology which empowers and enhances the driving experience. It is also claimed to provide glimpses into a high performance and efficient hybrid electric powertrain that is expected to deliver 550bhp while returning 5.5 litres per 100kpm. In addition, the new 2015 Infiniti Q70 made its premiere in Europe at the Paris event. This 2.2-litre turbo diesel model delivers 170bhp combined with low carbon emissions.